These seem pretty easily applicable to being a photographer, too. Perhaps the only one that doesn't make immediate sense is no. 5; being a comedian, Louie challenges himself to throw out his best jokes and forces himself to start over. Applied to photography it would mean, whatever your fallback is, your go-to, your "usual tricks" in my teacher Frank DiPerna's words, throw those out from time to time and force yourself to...well, see no. 1, "Try new things." just one more reason to love Louis C.K. As to #5, it's very much, at the very least... worth trying. After 40 yrs of shooting analog B&W with one lens, I'm now shooting digital color with a different lens- and having the time of my life! 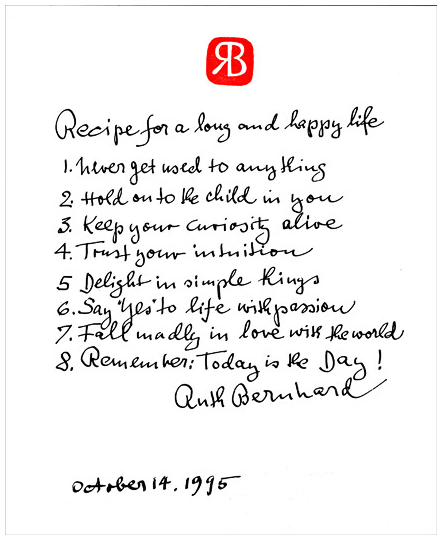 I liked Ruth Bernhard's Recipe for a long and happy life. Ruth told me that Number 8: "Today is the day!" was from a Macy's department store sign for women's bras. My father was for many years a professor of English literature. When he started out he used to prepare lecture notes for his classes. And every time he taught the same class again he would throw them out and write new ones so his lectures never became rote and stale. I assume you knew this, but Louis C.K. is an avid photographer and shoots with a Leica. Can't remember where he said this, but most everyone here can relate to it. "I'm not rich. I just spend all my money on cameras. It's important to me." I think rule five is the only interesting one. It is damn scary to let go of what's working. The rest of the rules are cliches we could read off "inspirational" posters. 11. Never follow life advice from someone you don't personally know, least of all a comedian. "I liked Ruth Bernhard's Recipe for a long and happy life. Ruth told me that Number 8: "Today is the day!" was from a Macy's department store sign for women's bras." Ruth was a remarkable woman and photographer. Thank you Robert! Why not, where's the rush? This one seems odd (as seen by a hobbyist at least). "Don't waste time" .... The most self explanatory rule. Time is all we have, and ultimately have absolutely no control over.